NexTrend home camera comes with a built-in intercom, have a smooth and clear talk with your family and friends, or speak to your pets wherever you are. NexTrend IP camera would switches into night vision mode automatically when the light becomes dark. The lens is encircled by infrared lights to capture clear video in the dim environment. Access your NexTrend WiFi camera from multiple smartphones, tablets, or even a computer and logging in with your account information. You will enjoy higher image quality from a higher resolution PC to catch more details. NexTrend security camera always keeps an eye on things that are important to you. With built-in high accuracy motion detection technology, the camera sends notifications to your smartphone alerting when, where, and what movement was detected, so you always stay on top of things that matter. Cloud storage ,offering loop-recording with no storage limit. Local backup supports up to 64GB Class10 TF card(not included). Receiving real-time activity alerts of motion tracking records while you're out. Adjustable low/medium/high detection sensitivity and 24 hours/7 days detecting schedule. This kind of camera on the market cannot support 5gHz WiFi currently. If you have a dual band router, please ensure your mobile phone is connected with the 2.4gHz WiFi. This IP camera needs to be charged when using. 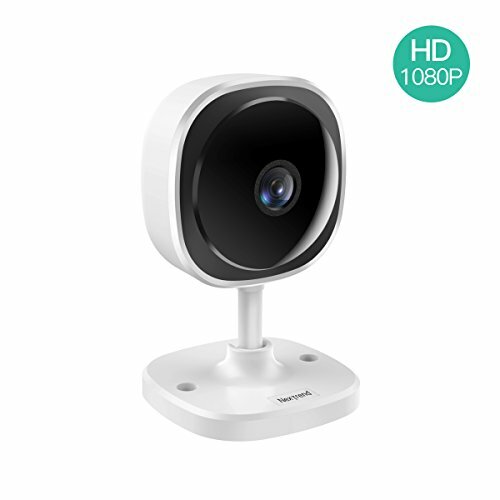 【180 Degree Wide Angle Lens】This wireless security camera is equipped with 180-degree fisheye lens. It's a panoramic IP camera which basically meet the vision of a small room. No need to set multiple camera at one room. The E-PTZ on the APP enables security camera to automatically control and zoom its view via its program settings. 【1080P FHD with Super Night Vision】This home security camera has full HD 1080P resolution that ensures crisp video recordings and images. The advanced IR night vision up to 30 feet in pitch dark with no light pollution. Intelligent IR-Cut switch ensures clear and high quality images both day and night. 【Smart Motion Detection&Two-Way Audio】With the smart motion detection, real-time alerts will be sent to your phone immediately when motion is detected. Two-way audio helps to scare the thief away. Those give you reliable security and surveillance for home or business. The responsive microphone and speaker also offer you a smooth conversation with your family at anytime, anywhere with your smart phone. 【Support Cloud Service& SD Card】Support the highest level of security Cloud storage, store your video safely and others are not authorized to watch. 30 days free trial cloud service for every new account. This IP camera also support SD card up to 64G for local storage. Excellent compatible and support remote viewing via iOS or Android mobile devices, Windows PC, Apple Mac system. 【Easy to Use& Reliable Customer Service 】The installation and configuration are very easy. Download the Danale App on your mobile phone and follow the instruction with voice remind step by step, no complicated setting needed. Any problems feel free to send a email to nextrend008@hotmail.com or call at toll free number +1 877-977-9688 (after 5 PM PST). Free return & exchange service within 30 days, free technical assistance and 1 year warranty. If you have any questions about this product by NexTrend, contact us by completing and submitting the form below. If you are looking for a specif part number, please include it with your message.